Looking for the best baby toothbrush? You probably had a restless night, spent the better part of your morning trying to change your baby’s diapers, and now, it is time you headed to the market to get a nice toothbrush for your them. And yes, obviously, it is not going to be an easy task getting the best product that will guarantee the maximum protection of your baby’s teeth. It’s quite frustrating, right? However, I got your back. Having dug deep into the market in order to unearth the best baby toothbrushes for your child, worry no more! After a thorough and extensive research, I have compiled the best baby toothbrush reviews for you. However, before I let you know about them, I will take you through the steps and criterion I used to draw my conclusion. What is a baby toothbrush? While your gum is hardened enough to withstand rough and sharp toothbrushes, your child’s soft and tender gum cannot withstand such toothbrushes. In fact, it would be catastrophic to use the normal toothbrush on your child since it would really hurt their gum. For that reason, there has to be something special for them. Having a soft gum does not make your baby immune to dental infections. It is for this reason that these special toothbrushes for your child have been manufactured. Soft-bristle: It is the soft bristles which make a baby toothbrush the best. After all, why would you buy your child a toothbrush whose bristles are as hard as those of your own toothbrush? Comfort: The comfort of a baby toothbrush, or any other baby product for that matter, is paramount. Your child needs to feel comfortable when you use the toothbrush on them otherwise, they will become resistant to the brushing process. Large size: It is crucial for a baby toothbrush to have a wide and long handle. Why is that? Come to think of it, a small handle could choke your child, or worse still, your child could swallow it. Harmless material: Use of harmful or toxic material for your child’s toothbrush should be avoided like plague. This is because it could harm not only the teeth but also their general health. What are the benefits of using a baby toothbrush? Well, apart from the fact that a baby toothbrush ensures that your child does not get oral infections, using a good baby toothbrush also protects your child’s teeth from infections caused by the sweet foods they consume every day. There are numerous types of baby toothbrushes. For instance, there are some which slip over your finger while others have a handle. The slip-over-a-finger type is awesome when your child does not have teeth since it is good for the gum. 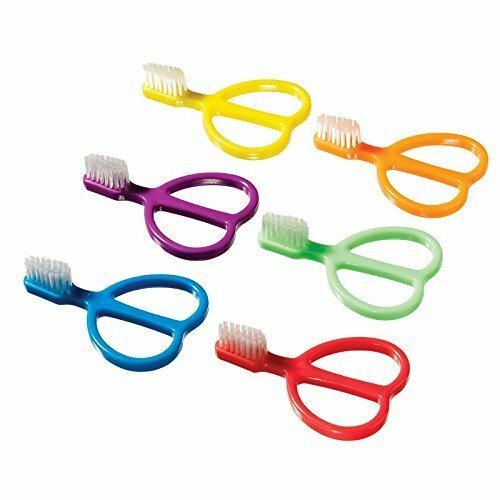 The ones with a handle are suitable for children with teeth. There are also powered and regular baby toothbrushes. While using a baby toothbrush, you need to ensure that you use it gently on your child’s teeth. Failure to do it softly could make your child’s gum painful which makes feeding them a hard task. One crucial thing you need to know about brushing your baby’s teeth is the fact that you need to wash your hands as well as the toothbrush carefully before and after use to avoid infections. This is paramount for dental care of your child. One, you need to ensure that you never let your child play with the toothbrush after use. This is because it could harm them. Secondly, you should never put your baby’s toothbrush in the same place with the adult’s toothbrush. This way, you can ensure that your child does not get dental infections. Before buying a baby toothbrush, you need to consider the age of your child. 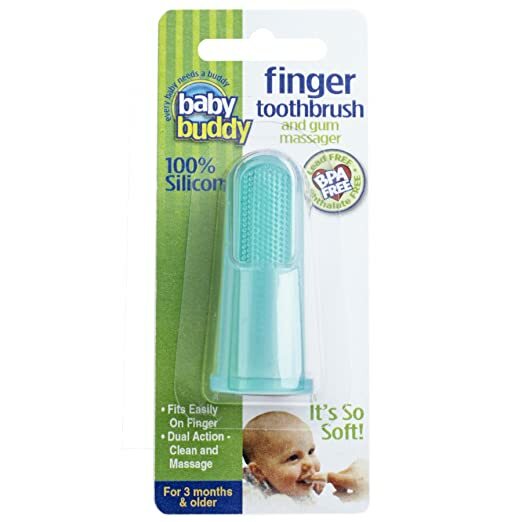 For small babies without teeth, you should get the slip over finger design while for those children who have teeth; you can get the ones with a handle. This 100% silicone baby toothbrush not only baffles with its outstanding softness but also assures utmost comfort for your child. Imported, this toothbrush grows with your child from birth to when they hit 12 years. This is ridiculously unbelievable. In fact, it is quite unique given the fact that some products can only be used during early infancy after which they lose purpose. The benefit of having your child grow with this toothbrush is the fact that they develop a love for brushing which makes them aware of the significance of dental hygiene. Fully certified and FDA approved. Dual sided with brushing and massaging bumps. Not so convenient for children without teeth. Looking at the degree of safety, coupled with its unique design, this baby toothbrush is simply impressive. In fact, being BPA free and FDA certified only crown it up making it among the best products in the market. BPA free, this learn to brush set comes with two brushes for learning and self-brushing. And yes, given the design, it qualifies to be among the top products in the market. With its round head, it can adapt to your baby’s mouth with much ease. This is a toothbrush whose performance is impressive. In fact, it is a must-have for any parent who wants to have their baby’s dental health assured. Unlike other baby toothbrushes, this learn to brush set has a red indicator which tells the right amount of toothpaste to be used. It is safe and BPA free. Comes with soft rounded bristles for maximum dental protection against bacteria. Does not grow with your child to maturity. It is only perfect at an early age. From a fair point of view, it is clear that this set is second to none. With some unparalleled features, coupled with its unequalled safety, this is what you need to introduce your child to if you want them to attain an awesome dental hygiene. Baby buddy is a household name. 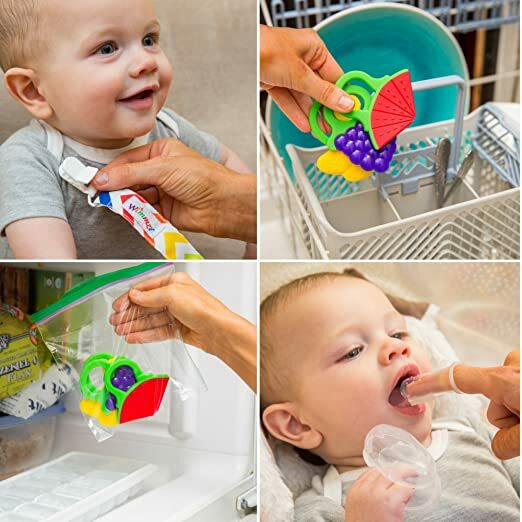 Having risen to the top of the market with its amazing products, you can never be wrong about this toothbrush teether for your baby. With a reputation that speaks volumes, this baby toothbrush teether comes with 6-stage oral care system. And, did I say that it is six sided? It closely and softly massages the gum and teeth to deliver impressive results. Comes with 6-stage oral care system. 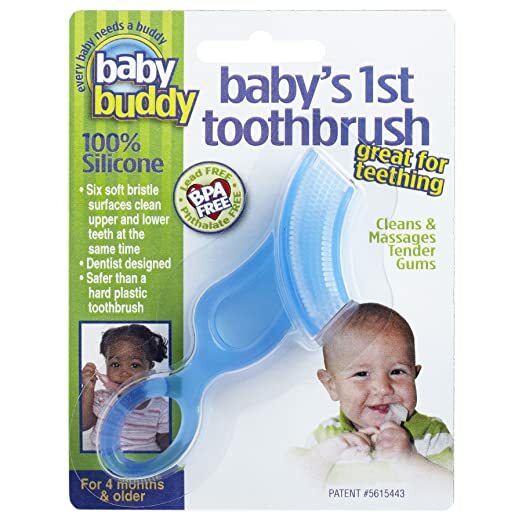 Given the fact that this baby toothbrush is FDA approved, BPA free and easily sterilised, there is no doubt that it is a must-have for anyone looking for a quality product. The price is a clear reflection of quality. Given its calibre, I think the price is convenient. My list would not be complete without this product. In fact, failure to mention it would portray inaccuracy on my part. Why is that? Well, given the fact that it comes in great soft bristles, there is no doubt that it is impressive. It also promises to walk with your child from infancy to the age of 3. This makes your child aware of their dental health. Brushes sold as a pack of 6. After looking at the features, I think this product is rightfully at the top of the market. Although it might not be best, I must admit that it is a product worth buying. As the name suggests, this is not just a baby toothbrush. It is a set of tools all aimed at providing invaluable benefits to your child’s dental heath. With a potential to relieve and soothe sores, itchy gums and discomfort, you can trust it. With an instant formula to cure pain, you should try it out with your infant. And yes, safety is simply out of question when it comes to this baby toothbrush set. Guarantees cure for sores and itchy gums. Purchasing the entire items increases price. There is no doubt that this is an awesome product. Whether you are looking for quality or simply focusing on safety of your child, this product is both. In fact, it is a baby toothbrush kit worth your cash. In conclusion, after thoroughly looking at all the features of each and every product, I hands down crown baby buddy as my top pick. Why is that? Well, looking at the points I stated earlier on how to get the best product, it beats all. Bristles are soft, the material is 100% silicone which is safe, it is BPA free and FDA approved. All these are what it takes to become the #1 baby toothbrush. For that reason, perhaps you need to try it out in order to confirm this. 5 baby gifts for twins boy and girl.